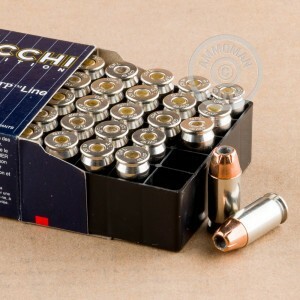 If you want to get a premium-quality self-defense load for your 1911 or other .45 ACP without paying premium-quality prices, try this ammunition from Fiocchi. Manufactured in Missouri and packaged in a 500 round case that gives you enough for both carry and target practice, this standard pressure load fires a medium weight 230 grain Hornady XTP bullet. The Hornady XTP is a very popular self-defense round due to its well-documented ability to penetrate assailants and expand to cause incapacitation. Its high penetration is especially welcome in the powerful but relatively slow-moving .45 Auto. 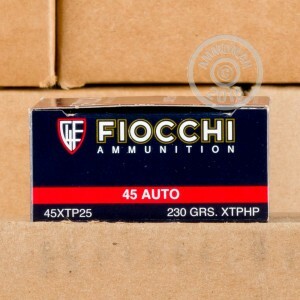 Grab this 500-round case (10 boxes of 50 rounds each) or any other items totaling $99 or more at AmmoMan.com to qualify for free shipping!